Hope you haven’t forgotten about the costume contest!! You have about 16 days to enter! I recently had a lesson about podcasts. It explained in detail what it was, how to listen to one, and how to make one. This gave me an awesome idea. 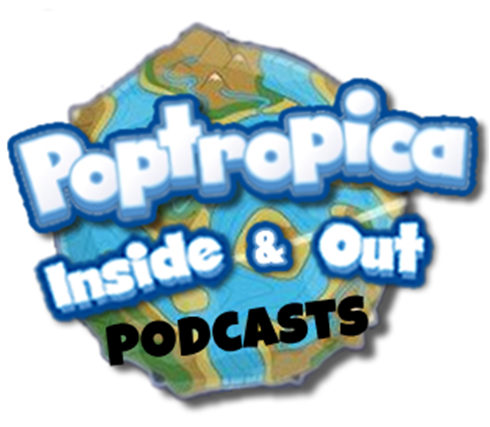 What if PIaO had a weekly, or biweekly, podcast? 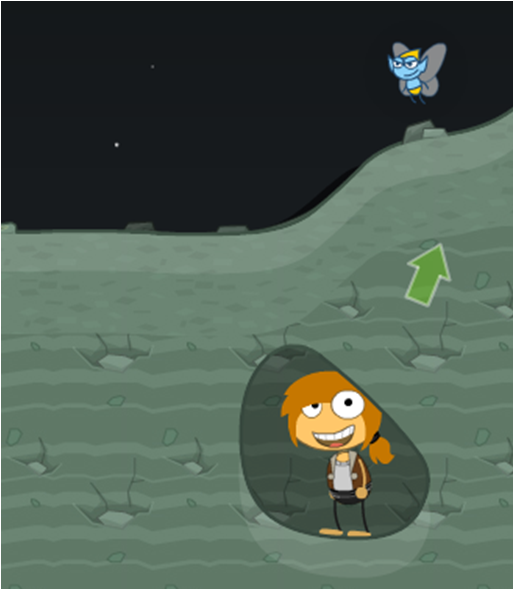 There would be nothing on the screen; just voices, so you can listen while playing Poptropica, or even blogging. We could talk about numerous things, and even have guest bloggers on our show! So maybe a little more of a show than a podcast. Maybe we could even kind of combine them. I, of course, would be the head of the department, but if anyone has computer or graphic smarts and wants to help, they can. Shut that question back in your mouth. There are MILLIONS of things to talk about. We could talk about the pros and cons of the Sound Updated Islands (WATCH OUT, FIRST EPISODE!). We could talk about PCon3. 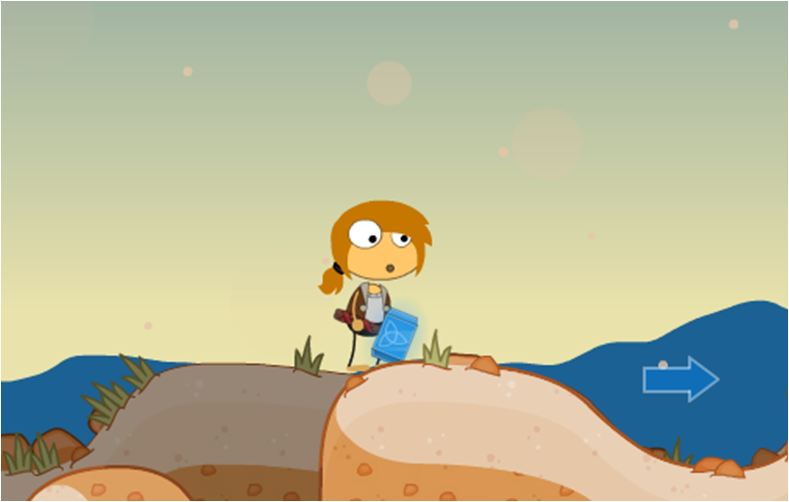 We could talk about any and every single island out there in Poptropica. I want to go for it!! Who’s with me? 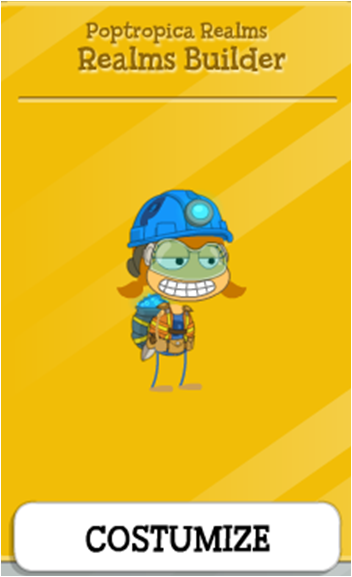 Do you know any Cool Poptropicans around in Poptropica? This is a quick post to let you know that we really need some help! To sign up, please click here! We are currently changing our logo to something a little more friendly to our upcoming authors (thanks Short Lion! ), so don’t worry about that! P.S. Lots of news coming your way either tonight or tomorrow! The next SNS will be on April 19! Hey everyone! It’s Trusty Biker over here! So, in our last Sunday Night Special, we mentioned that we would be moving our site. And that’s no lie! Previously, we had our site over on Wix. We also had this site, but we didn’t keep up with it that much. Now, we’re going to discard our Wix site, and do everything fully on this site! If you only read posts on this site anyway, it won’t affect you. Everything, and I mean everything, will be on this site. Here are a couple details about our move; what we’ll be losing and gaining. Our site-members feature. You’ll no longer be able to sign up to become a site-member, and access the special pages on our site. They’ll be open to the public! Our forums page. On our old site, we had a forum that anybody can access, and it was really cool, but on WordPress, you can’t have that, so we’re losing that page. That’s basically all we’re losing, or all I can think of, that is :D. The good thing is, nothing is really SUPER important, and that’s a GREAT thing! We’re not even losing our Sponsors! 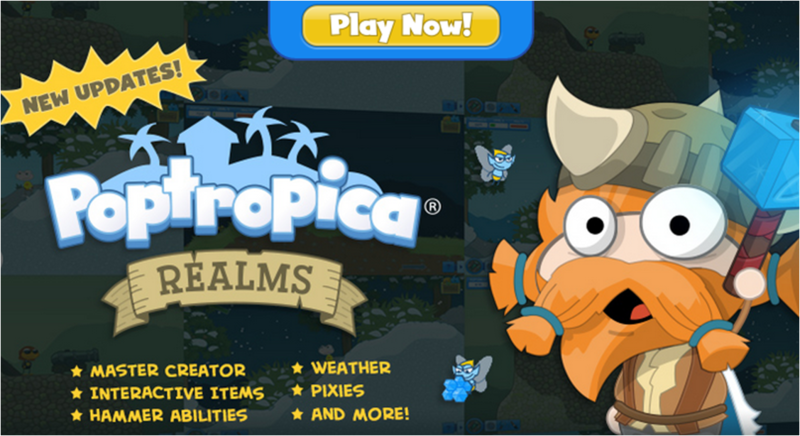 So, if you’ve been on Poptropica Realms for the past couple of days, you’ll notice a huge update on Realms. Here’s a list. I’ll go into more detail about each one later on in the post. New hammer abilities- Ground Pound, Hammerang, and Super Jump! Get 2 costumes-one with a promo code, and one when you reach level 15! Let’s get into more detail, shall we? Okay, first, weather! 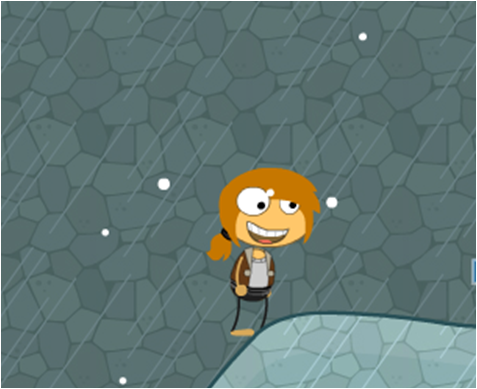 In the forest biome, you get rain. Just rain, and it doesn’t do anything to you. You can even hear it! In the snow biome, we’ve got snow, obviously. And in the sand realm, you’ve got sandstorms. 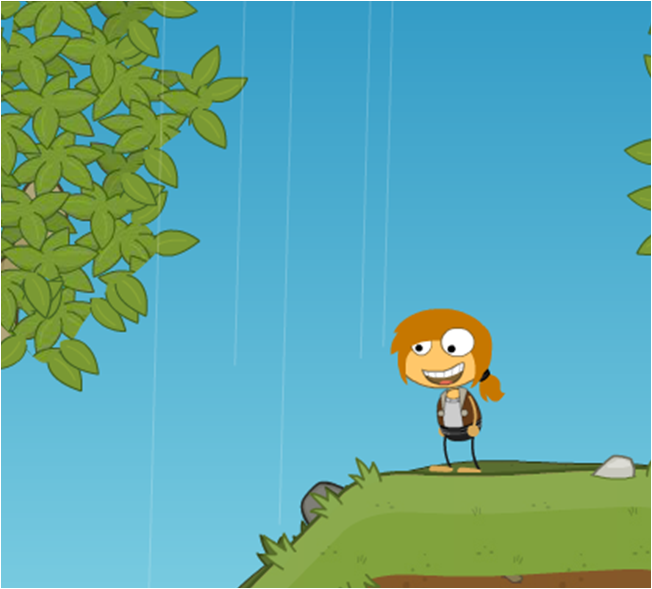 Oh, and watch out for the weather in the Lunar Biome and Swamp Biome. They have acid rain and meteors! It takes away your health if you don’t get under something. What’s next? Oh yeah! The hammer abilities. If you look at the bottom of your screen, while in Mine mode, depending on what level you’re on, you’ll see 3 images. I’m in level 11, so I only have 2 images. Now, we’re going to talk about the costumes! If you enter the promo code, GOREALMS, you get a cool Realms Builder Costume! Now, my least favorite part of the update: Pixies. They appear in the night, and in the first few lights of day. They come out and, WAM! They take 10 Poptanium from you! Why the only thing you can do to escape this is dig a hole, trap yourself, and wait until morning comes. Luckily, if they steal your Poptanium, grab your hammer and give them a blast. They’ll drop your Poptanium and fly away! Now, for the last part of the post-the interactive items! If your health is low, build a type of food, like apples or even spaghetti. 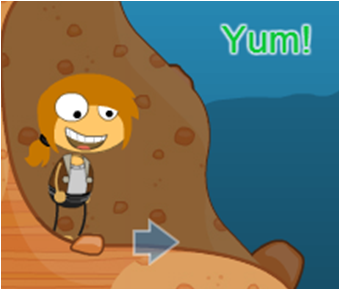 Then, go to explore mode and click on the food you built. Your character will say YUM! and your health will go up! On some other blogs, I’ve heard that there are more interactive items. All I can find is that if you put the chest, and click on it, it will open. If anybody in the comments have found some more interactive items, let me know in the comments or send me a picture! Well, that’s all for today! If anybody has any questions concerning our move, or about the Realms updates, let us know! Comment below, or send me an email at trustybiker031@gmail.com! P.S. Don’t tell anybody, but we will be having a page where you can become an author on our blog soon! 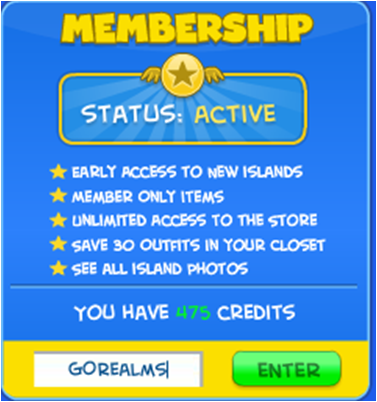 Categories: Poptropica Realms, Updates | Permalink.